Hope your Black Friday is treating you well! There are a lot of makeup sales going on right now, but so far I’m behaving myself. We’ll see how long my will power holds out. 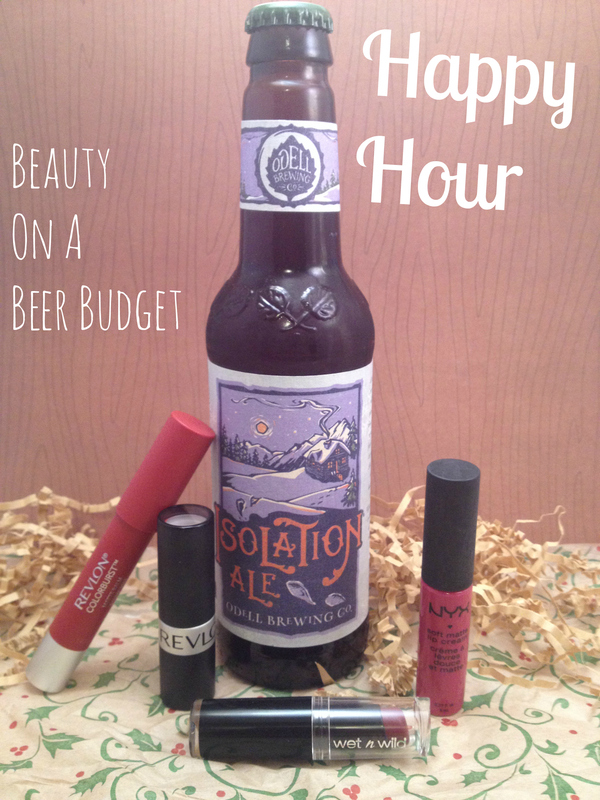 In general, I’m not a big fan of Black Friday, (I hate crowds), but I am a fan of dark beers and lipstick. So for Happy Hour today, I picked one of my all time favorite beers ever, which happens to be part of Southern Tier’s Blackwater series, their Creme Brulee Stout (get it? Blackwater? Black Friday? PS: I’m on a lot of medication right now for the rudest Sinus Infection ever, so excuse any weirdness). I also finally got my hands on some Colourpop lipsticks. I’ve been eyeballing them for awhile, but I thought they were probably over-hyped. $5 for a long-lasting, pigmented lipstick just seemed to good to be true. But I decided to just jump right in when I saw their holiday collection, Forget the Fruitcake. $30 for 6 lipsticks, and free shipping was just too nice to resist. I hope you are enjoying turkey today, or in my case vegetarian stuff turkey. When I started this blog in July, I was fairly certain I would only have one reader and it would be my mom. Well, both of these predictions are wrong. I don’t think my mom actually reads my blog, (no worries mom, you are a fabulous, busy lady!) 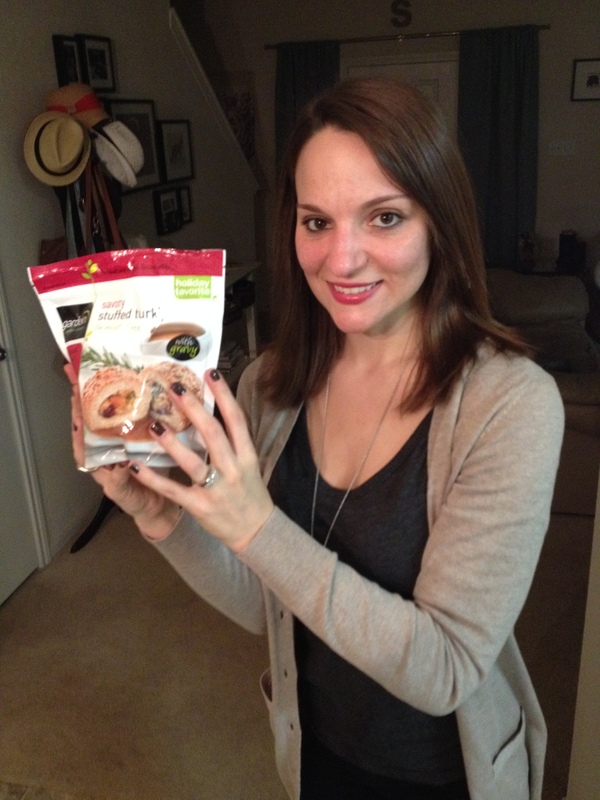 and I have gotten to meet and talk with so many awesome blog readers! Way more than one! So anyway, I just wanted to say thank you to all the lovely people who drop by and check out the blog. I’ve loved reading your comments and getting to know all of you. I am so thankful for such fabulous readers and you guys always make my day with your sweet thoughts. 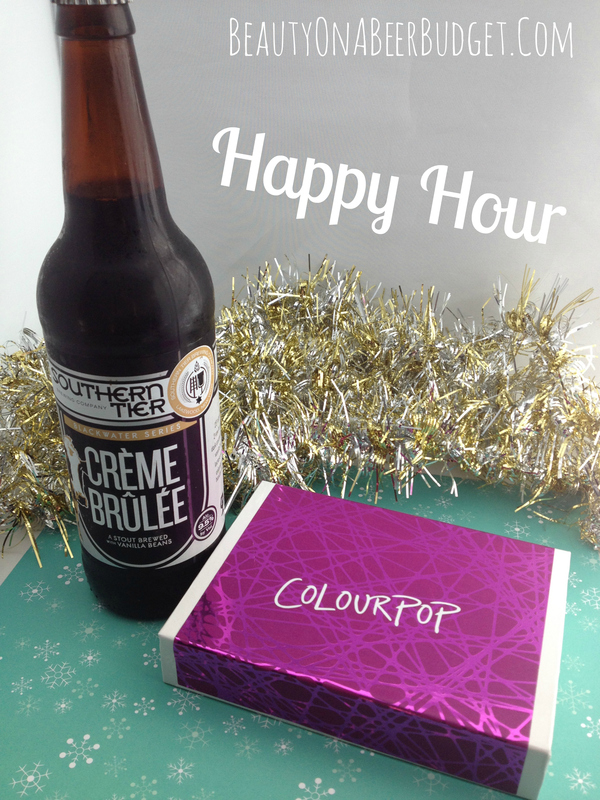 See you tomorrow for happy hour! -What are you thankful for? -Do you have any black Friday plans? I’ve been working on starting up this little Wednesday feature for awhile now and I think I’m finally ready to go live with it. 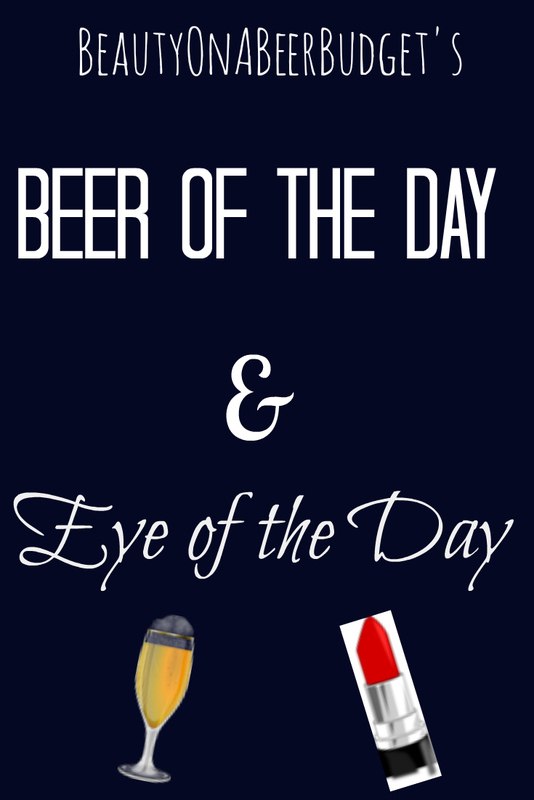 In a quest to feature more beer and more eye shadow, (two of my favorite things), I thought I would try a weekly feature showcasing a delicious beer and an eye look. I’m not a master of make up, but I’m hoping the EOTD can help those of you who are wondering, “What the heck is she doing with all those powdered pigments?” (Maybe only Mr. Danger is wondering that, but still). 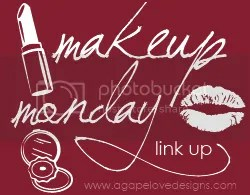 Or maybe I can just help you get some inspiration for your own eye look! Or maybe you just like glitter. I’ll be trying to address all these needs. In my Happy Hour posts, I usually feature beers that are seasonal or have mass appeal so those new to craft beer might find something they like. These BOTD features are going to be beer reviews of just about anything and everything, so you never know what might show up. So that’s the plan for these weekly posts. I might play with the format a little as time goes on, but let’s go ahead and roll out Week 1! Two posts in one day!? My, I am behind on posting and desperately trying to catch up industrious and productive! I’ve got a new feature I’m trying out tomorrow, so I was trying to get all my subscription reviews for the month taken care of. Let me tell you, my arms were looking pretty glittery after all those swatches. Anyway, I always seem to get Notoriously Morbid’s Vanishing Cabinet later in the month and I have to make myself not peak at other people’s reviews, because I like the surprise. However, every month it seems it’s completely worth the wait, because I’ve been super pleased with every VC I’ve gotten from them. The Vanishing Cabinet costs about $13 a month, and it is a reoccurring subscription. Unfortunately, at this time there is a wait list. However, I believe the Notoriously Morbid owners are going to be opening more spots next month. These ladies have a good thing going on, so I’m not at all surprised by the popularity the Vanishing Cabinet has gained. They usually do have overstocks of some of their VC eye shadows for sale on their website, if you really need to get your hands on a shade. 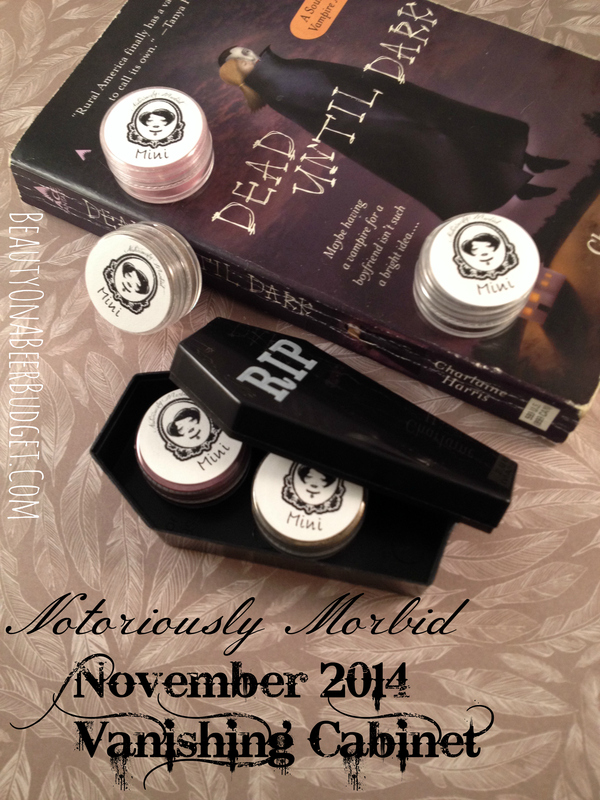 This month the theme was DeadLove, based on the Sookie Stackhouse books. (Not the show, bless those NM ladies.) I happened to start reading these books when I was but a young, nerdy girl of 15, and they hold a special place in my heart making this months’ VC even more fun. 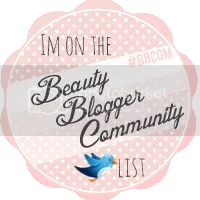 If you’re curious what kind of items come each month or you just want to drool over some shimmery, gorgeous eye shadow, OR you want to know my opinions on Sookie’s boyfriends, look no further! Why yes, that is my 2001 copy of the first Sookie book. I’m a nerd, friends. 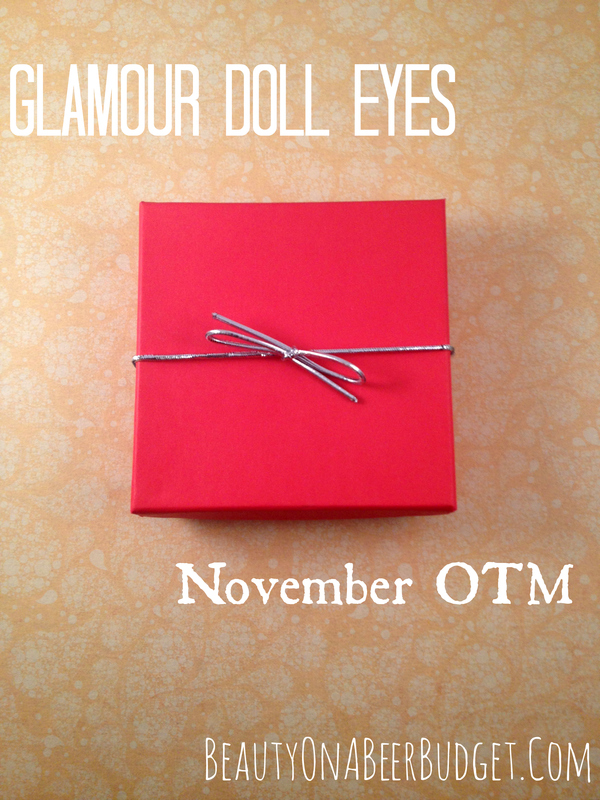 Well, I managed to get a Glamour Doll Eyes’ OTM box this month! It was an exciting day for me as these $8 subscriptions go like hot cakes each month. They’re usually released when I’m at work with the slowest internet connection known to man, (like really, really, really slow. I think I could actually hear the internet wheezing in pain), so it’s not everyday I succeed in this endeavor. And I’m glad I did, because I adored this month’s OTM! If you’re new to Glamour Doll Eyes their Color of the Month subscription is not necessarily reoccurring, but sold by the month. For example there were 12 month, 6 month, and 3 month subscriptions. At this point in the year there are only 1 month and 2 months, left. My internet only allowed me to get the 1 month, which means I’ll have to battle again in December if I want the OTM then. It’s intense, but worth it! Hello cute box that I will re-use for Christmas presents. Then a friend was in town and I got to have beer flights. So I consider it a successful weekend. 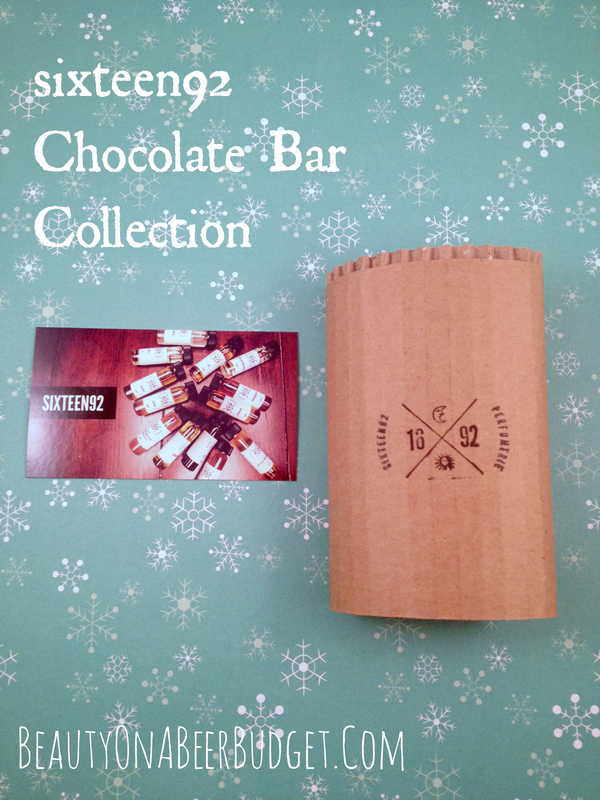 Today I’m kicking off the week with sixteen92’s Chocolate Bar Collection. Yes, an indie perfume company made a perfume collection based on hot chocolate. And yes, it’s amazing. sixteen92 also has a Winter Collection, that I’ll be reviewing in the next week, (presumably), but I had to start with the Chocolate Bar collection. Because it’s the Chocolate Bar collection. I don’t feel like we need anymore explanations about why it’s awesome. The sample size set of this cost about $22 with shipping. I ordered it Nov. 7, it shipped Nov. 10, and I was covered in hot chocolate scents on Nov. 13. Pretty impressed with this turn around time! Grab yourself some sugar and read on! I had the grandest plans to finish editing a few posts and have them up this week. Unfortunately, this week then went kind bananas and that didn’t happen. I got home late from work/grad school every night this week and passed out watching Gilmore Girls on Netflix instead. (#PARTYLIFE.) Hence, the radio silence for the past few days. The good news is I now have a ton of posts for next week and it’s Thanksgiving week, so we’ll pretend I meant to do it. Yeah, I was planning it that way for the holiday week. Sure. I was going for a winter type theme for this picture but somehow it turned into a nativity type theme instead. Oops. I got my Rainbow Honey bag in last week and I’ve been testing it out for awhile now, really researching the products and all. (AKA not finding time to write this review, oops). 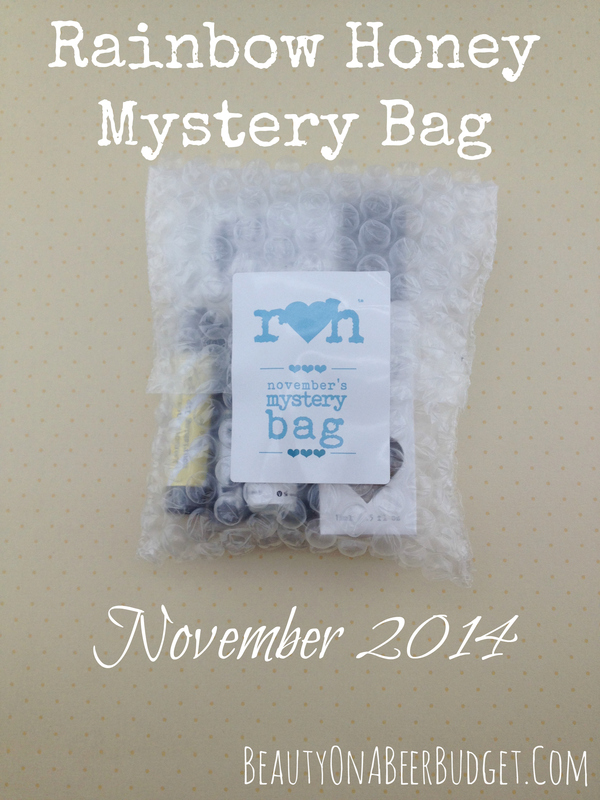 For those of you who are new to Rainbow Honey, they’re a nail polish company that offers a monthly mystery bag filled with goodies. There’s a full size and mini size, which I get for about $13. It usually proves to be a great deal for the money as I get a lot of good nail products for cheaper than I would have paid in the store. Plus there’s almost always glitter. This month they had a theme of taking care of your skin in the winter time, which I think most people can appreciate. It’s unseasonably cold where I live and my body is falling apart, so this bag has been pretty timely for me. I think I’m digging the new wrapping, it does look a bit sleeker. How was your weekend? My baby brother was in town! He’s the Production Manager for a band and I got to see him and go backstage, it was fun! 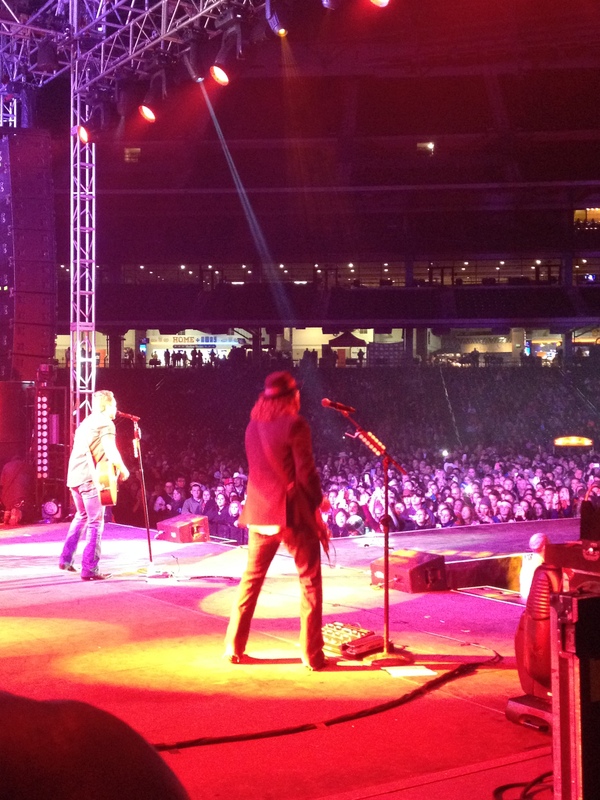 Also it’s the only time I’m ever VIP for anything, so I always feel pretty special. Hope you guys had a good weekend, too. So. I am really bad at not blogging. I know I said here that I was taking a break, but it seems the closer I get to finishing the thesis, the more blogging I do. * This also appears to be directly connected to the fact that as the holidays get closer, more and more awesome beauty things get released. And I just can’t contain my glee, Solstice Scents’ Foxcroft’s Autumn Festival Colletion is a prime example of this! 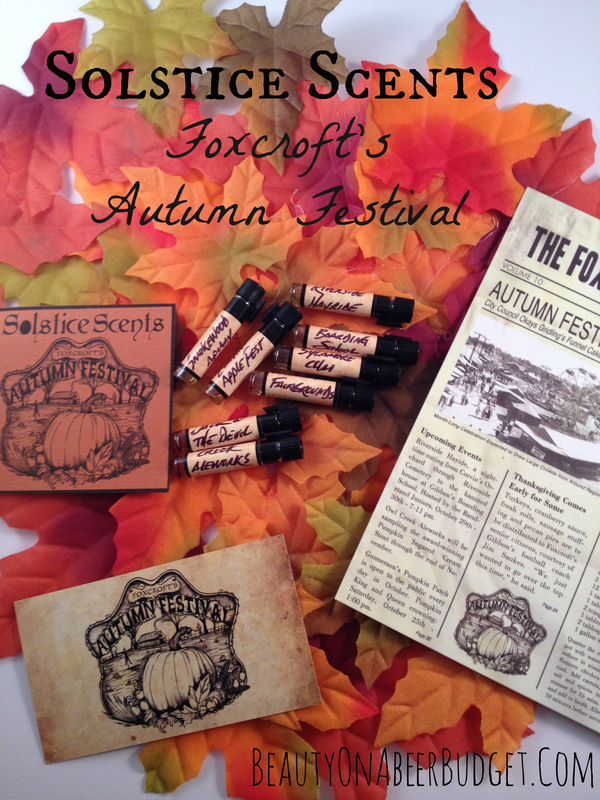 When they released Foxcroft’s Autumn Festival, I grabbed a sample set, for about $20 with shipping. This was both a bad and good idea. Bad because I want some full sizes and their bottles are on back order, good because there were a few surprise favorites I wouldn’t have ordered in full-size originally. I bought my set when the Collection went live on the Nov. 1, it shipped Nov. 3, and I was drooling over it on Nov. 8th. Not bad! Before I get into the scents, I am going to admit some bias right now, I have become a big fan of Solstice Scents in the past few months. Their oils work really well with both Mr. Danger’s skin chemistry and with my own. I’m not sure why this is, but of all the indies I’ve tried, SS’s perfumes smell stronger and last longer on me. Skin chemistry appears to be a fickle thing, so I highly suggest sampling perfumes before you commit, but Solstice Scents has become much beloved in the Danger Household. Now, even though I already have some love for Solstice Scents, I did keep an open nose when testing out these scents. Don’t you love their packaging? It’s super cold where I live! This is highly unusual this time of year, so I am very excited. It actually feels like fall/winter! So I abandoned all plans of fall beers, (AKA I drank them before I remembered to photograph them), and I’m jumping straight into winter! For the next month or so I’ll be featuring winter and holiday beers, and eventually a few of my favorite stouts and porters that taste fabulous this time of year. I’m also trying to feature some makeup products I love during the winter and holiday months, so hopefully all of that will get you into the season. 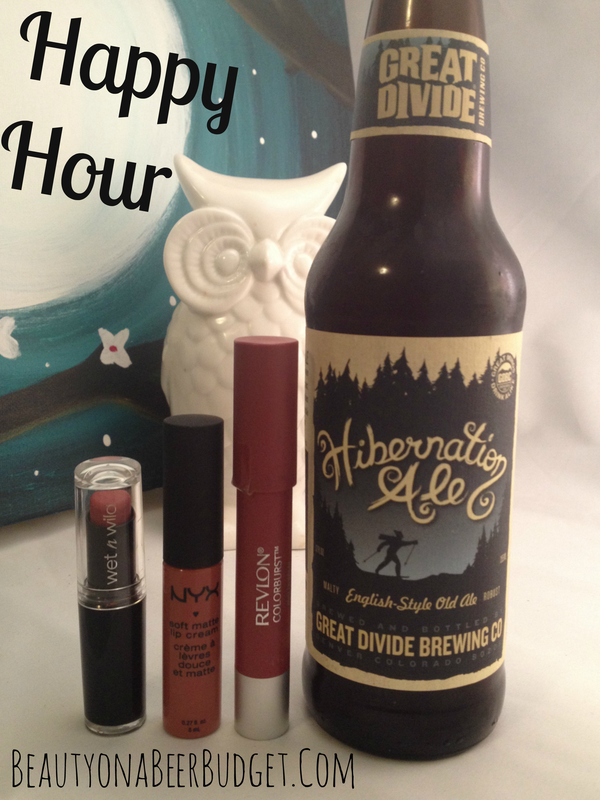 Also, I’ll plan ahead better so there won’t be creeper owls every Happy Hour. (Spur of the moment idea=creeper owls.) So no worries.